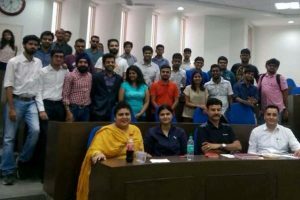 Polaris India recently concluded a workshop on International Marketing at IMT Ghaziabad for the second year students of PGDM (Full-time) as part of their elective course in International Marketing. The workshop was conducted in three phases of one day each spread over three weeks (i.e. Jul 12, 19 and Aug 2, 2016). Mr Pankaj Dubey, Country Head, Polaris India led the workshop while Ms Runa Ahlawat, Marketing Manager and Mr Anil Sapoori, National Sales Head accompanied him. Dr Soma Arora, faculty of International Marketing at IMT Ghaziabad planned and executed the workshop. The outcome of this workshop was a Country Marketing Plan for three select markets – Nepal, Sri Lanka, and Kazakhstan – for the Polaris ATV Off-Terrain Vehicles and Indian Motorcycle. The Polaris team left very satisfied with the students’ response and welcomed their ideas with a surprise gift of Polaris rides in the special Polaris Experience Zones. Dr Soma expressed that it is a distinctive step towards meaningful crowdsourcing in the area of marketing.